Put the meat through a meat-grinder and combine well with sliced onions, salt, red and black pepper. Rinse off the young grape leaves in hot water and place flattened on the work surface. Put a small amount of the meat filling in each leaf and roll up. Place dolmas in a pot, add water, butter, and spices. Cook on low heat 25 minutes. 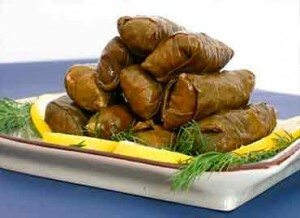 Serve 8-10 dolmas on a plate and pour broth over top.